Today: Tortilla soup escapes the 1990s. I'm going to blame the 1990s for sullying tortilla soup. 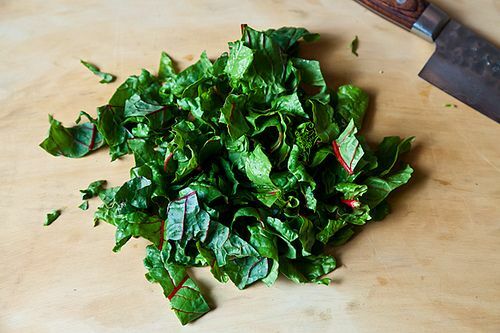 By the end of that colorful, fusion-obsessed decade, every fast-casual restaurant seemed to be peddling the same muddy version. 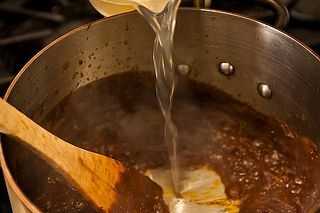 You remember it: burnt sienna broth with a few shreds of chicken and tortilla dangling in it, along with maybe a handful of Niblets. It was just fine -- and always more interesting than the split pea, so I bet you ordered it a lot. I sure did. Split pea should really try a little harder. But there are all kinds of tortilla soups out there. It's not just a sad American commodity in a to-go cup, but a truly regional specialty that repurposes the daily bread of Mexico in different ways all over the country. Some cooks actually blend the tortilla into the soup to thicken and fortify it, much like Tuscan ribollita. Some call for chunked carrots, or beans, or pork, giving it the heft of a stew. Others dot theirs with not just chips and cheese, but avocado and crema, getting as close in spirit to nachos as they can. Chicharrónes aren't unheard of. 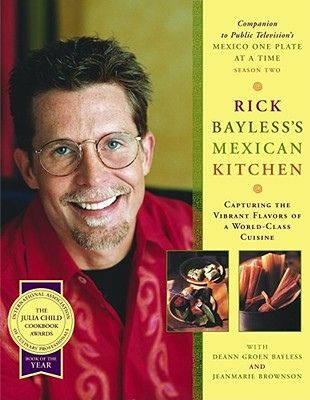 But perhaps the most genius version comes from Rick Bayless, whose own rise to fame mirrored and probably fueled that of tortilla soup. As you likely already know -- from his many cookbooks and accolades, his Top Chef Mastery and PBS series Mexico: One Plate at a Time, and that moment when he was rumored to be following the Obamas to the White House: for a guy from Oklahoma who isn't Mexican at all, Bayless knows a lot about Mexican food. He was qualified, then, to introduce a simple, excellent version of tortilla soup in Authentic Mexican in 1987 -- and he's been including variations in most of his cookbooks since. 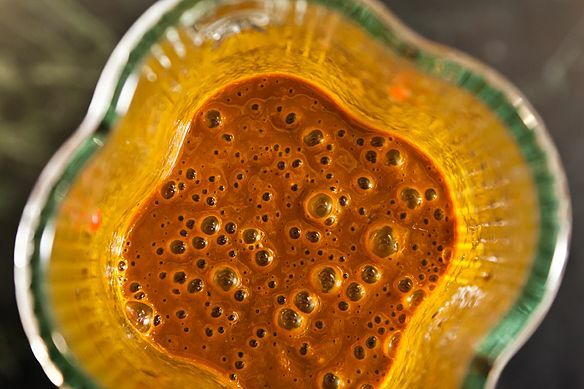 "I wrote a classic but flexible recipe for it in Authentic Mexican, but I still have more to say," he wrote in the headnote to his genius-ified version in Rick Bayless's Mexican Kitchen almost 10 years later. 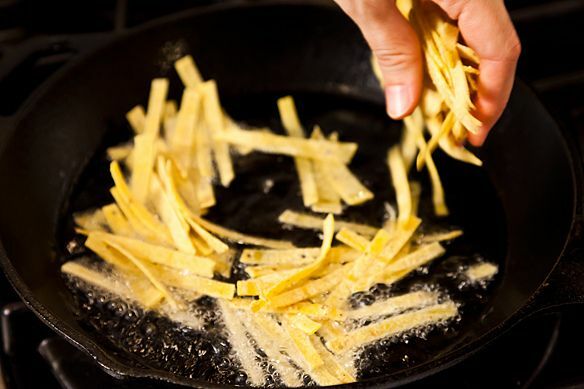 In it, he sharpens the flavors and textures, leaving a more vivid impression than before. He takes some of the toasted pasilla chile garnish he'd only scattered on top in earlier iterations -- and blends it into the soup base, unleashing it. 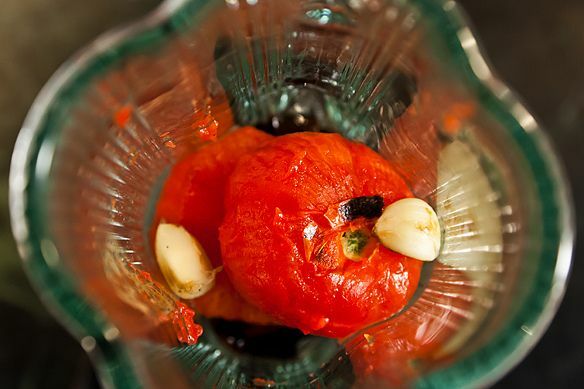 He singes the tomatoes and garlic and blends them in too, but leaves the golden threads of onion intact: barely there wisps that put up weak, sweet resistance. 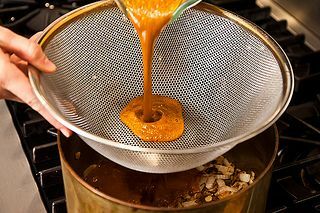 Then he cooks down and caramelizes the base before sending it billowing through the broth. Thirty minutes pass and he adds a final touch of genius, just a wee jag off of tradition, a tasteful dose of fusion: shredded red chard. 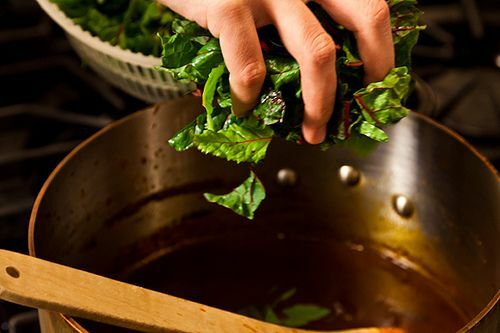 Not only does it give the soup health, color, and feeling, but the earthy minerality of the greens fits in perfectly with warm, sultry broth. Don't expect the soup to be spicy -- pasillas (also called chiles negros) do something more surprising: they're dark, smoky, and fruity. 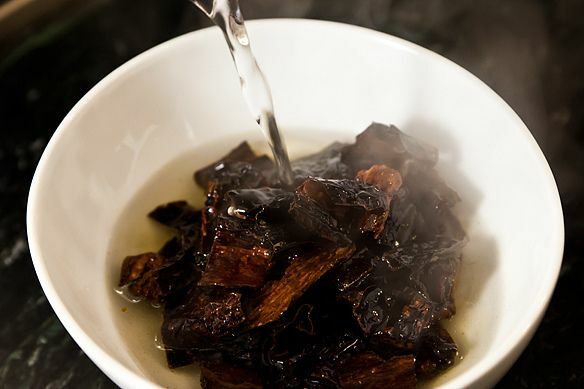 If a prune and a sun-dried tomato had a (way cooler) baby, it would be a chile pasilla. 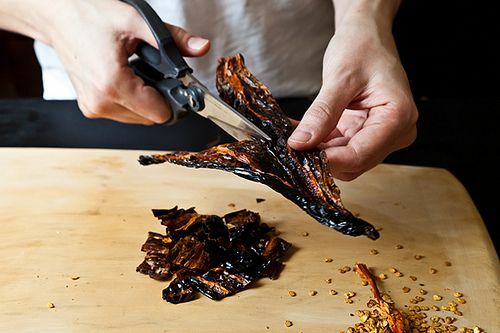 This might sound like a lot of steps, but each one is quick and advances you toward soup with a checklist that's anything but tedious: Cutting chiles with scissors! 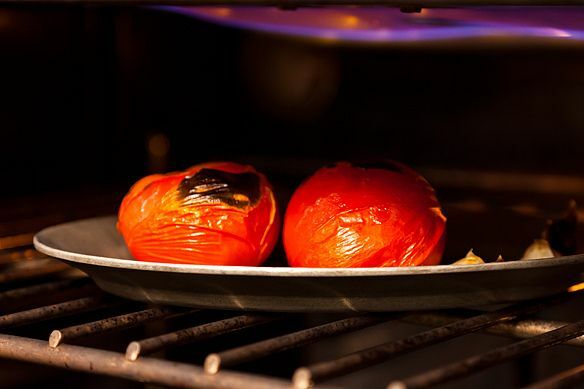 Blistering tomatoes! 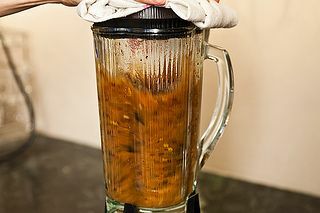 Blending violently! Plus the instructions make up for lost time elsewhere. The whole soup, complex and thrilling as it may be, can come together within an hour, give or take. The broth is enchanting on its own, and the garnishes electrify it. 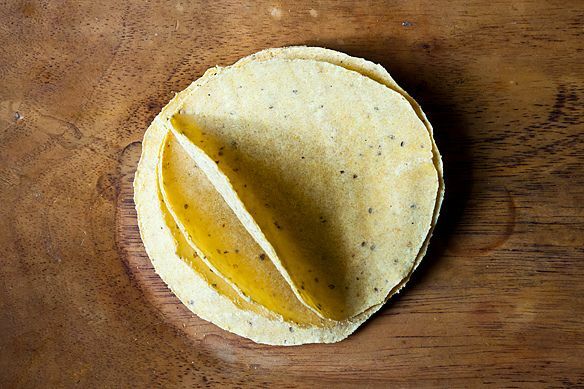 Lime sparkles, sweet toasted chiles crackle and bend, cheese clings to your spoon, and crisp but vulnerable tortilla strips sink in, encouraging you to spoon faster. The day after Thanksgiving, I had friends over and served the version of this soup on the Frontera Grill website but with turkey and turkey broth. My guests literally picked up the pot and drained the dregs into their bowls. 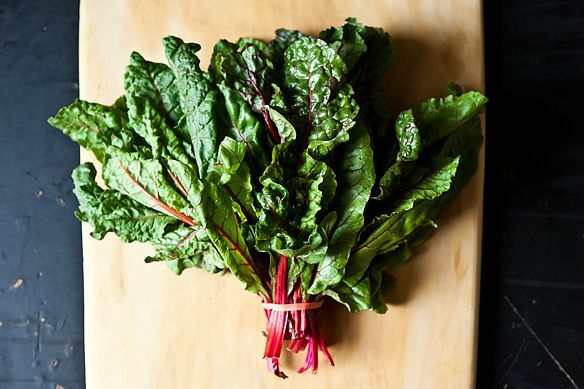 I haven't tried it with chard, but I will now! RB taught me the joys of beans and greens! I'm sorry for my delayed response -- thank you all for your lovely comments. Hope you like the soup! It's a good one. made this last weekend, it was fabulous..not just the taste, it was gorgeous to just look at. The flavor deepens beautifully the next day. I made this last night and it was really easy and good. I did add pieces of avocado to the soup and the lime gave the soup a nice kick. Will definitely make again. 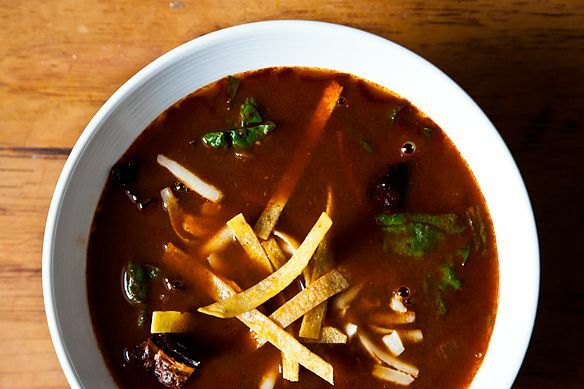 Tortilla soup for 2012 sounds great, but I recall, back in the 80's when we used to get a creamy, tortilla soup at a Mexican restaurant on the upper east side in Manhattan. I don't remember the name of the restaurant, don't remember anything about it, but only remember the tortilla soup that I've never found anywhere else. Does anyone else remember it? Kristen, your writing pops off the page and so do James' pictures. Thanks so much for posting this. 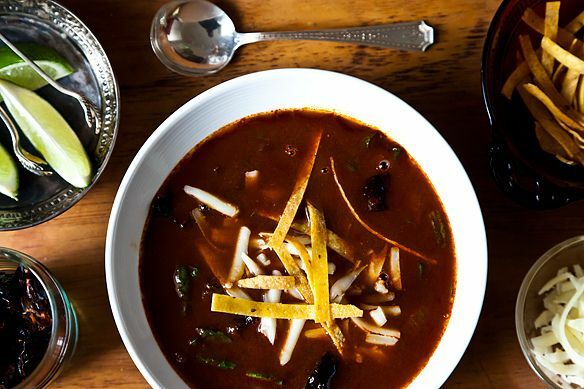 I'd recently been hunting around for a good tortilla soup recipe and this sounds like the one to try. Thank you, Kristen! As usual, another genius recipe that I have to make right now. Or very soon. I'm thinking this may be THE soup that all the eaters in my family (with all of their palate quirks and requirements) love. I'm on the verge of virtually giving you a big bear hug *HUGS*!! Been searching my head off for a good tortilla soup recipe.. (vegetable broth would make this a splendid vegetarian soup).. thanks so so much!! So happy to see this recipe featured as a genuis recipe! This is a regular dish in in my kitchen rotation. I make it for weeknight family suppers and I have made it for dinner parties. 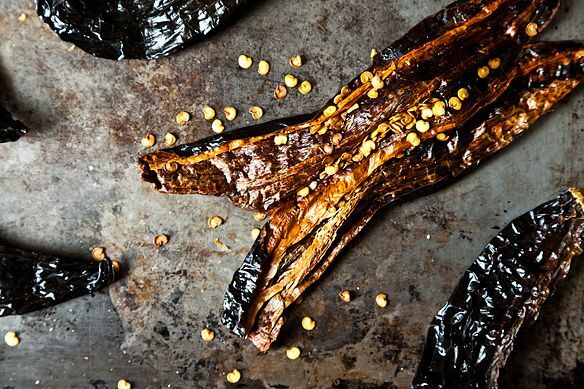 Kids love it because it is not spicy and they can add their own garnishes, and adults enjoy it because of the smoky, interesting flavors --- such a great use for pasilla chiles. Highly recommended!